…while Ren peered out at the sea ahead of them. …as well as a glorious shield that was propped up against her table green, and gold trimmed like her armour, but with a golden oak tree in the middle of it. …she sang as the musicians played music. Though she could not hardly hold a tune, her spirit was truly into it. “Ah, yeah, that’s LARIS… She’s a Green Knight,” he spoke unfamiliar words, then went back to work. Ren sat on a stool and watched, “A Green Knight…” he spoke under his breath. An hour or so later the girl approached the bar near where Ren was sitting, “Haren, could you grab my tab for me…” she spoke, then turned and stared at Ren, who was likewise staring at her. “You’ve been watching me for a quite a while Tiefling… If you’re looking for a night, you won’t be getting it from me,” she spoke. The bartender brought her, her tab, and she paid, plus a few silver in tip. “Could you tell me, what is a Green Knight?” Ren boldly asked. “Paladin of the Ancients… I can’t say I have much familiarity with that Order…” spoke Ren. She nods, then disappears into the sleeping quarters of the ship. “Alright Sis, would you tell us a bit about your Paladin, Laris…” speaks Johnny. 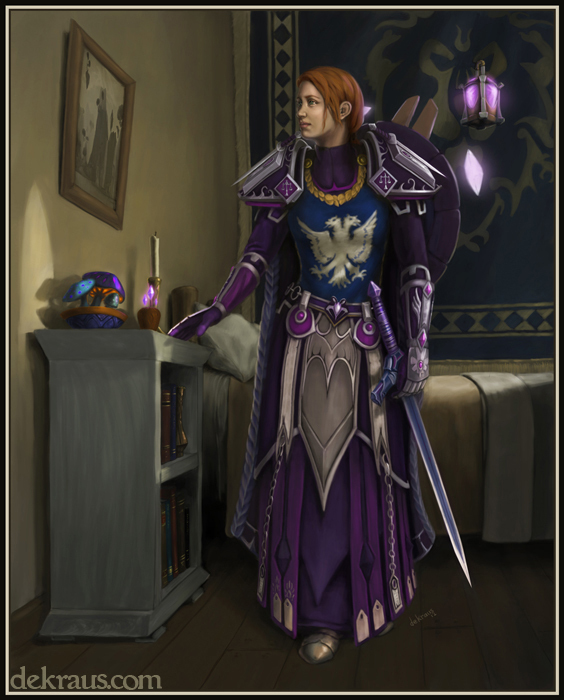 “Sure… She’s a 3rd Level Paladin of the Ancients… She has long black hair, which she normally keeps in a braid… Green eyes… She has fair skin, she’s 5’7″ tall, and weighs about 130 pounds… She looks to be in her mid twenties,” she describes. “Thank you Sis, we can continue,” replies Johnny. “May I join?” he asks. “Of course, always enjoy taking money from a friend,” replies Kinner playfully. …Ren and Kinner look back, and it’s Laris. “Don’t get your hopes up, she’s a Paladin,” speaks Ren. “You know her?” questions Chi in surprise. “I can’t say I ‘know’ her, but I did have the honor of meeting her last night…” replies Ren. “An honor, eh,” comes Laris’s voice from behind Ren. “Care if I join you boys,” she adds. The four of them play for hours, telling stories, drinking, eating and making merry. Dane (Introduced In Episode IV) hadn’t ridden but half a day, before his horse Scarlet sensed something, and came to a halt. Beyond he saw them, three orcs who looked to be setting up a campfire, as it would be night soon. “Only three of them,” he spoke quietly under his breath. “But why are they here” he thought to himself. Dane wasn’t the wisest of men, but he was fluent in Orc tongue, and felt this would be a good opportunity to put it to practice… If he could only figure out a way to get rid of two of them, leaving one for questioning. Suddenly Scarlet broke loose and rode straight through the camp! While one stayed back to make the fire. The Orc turned to see the Warrior running directly at him, and lept out of the way! Dane then stood across from him, and pulled his pole arm from his back. The Orc grabbed his spear, and spotted a bone horn near by. Dane then charged the Orc, leaping clear over the fire, and striking him, damaging his shoulder badly. Dane looked to see if the other two Orcs were anywhere to be seen, but they weren’t. …and dragged him a hundred or so yards away, propt him up against a tree, his hands tied behind his back, and tossed water in his face. “Spri Quon Rarg Nah (Why are you here? )” he spoke as he held a large dagger against the Orc’s neck. “Kor…(Introduced In Episode VIII)” replied the Orc. Just then he could hear his horse approach, and the other two Orcs in pursuit from some 80 feet back. Dane quickly mounts Scarlet, and they ride off. “What did they call him… This… Yellow Golden Paladin?” Harvey questioned Felix as they made their way. “Flare… But I wouldn’t call him that if I were you,” replied Felix. Suddenly Samuel points at Lenny’s Diner, and the other two men nod… they go inside. Disregarding the many unhappy looks, their attire gave away that they live on the streets. They sit at a window table, and watch outside as the snow fills the streets. “So what should I call him if I see him?” questions Harvey. A waitress comes to the table. “What will it be for you three gents…” she inquires, chomping gum, and not really looking directly at them. “Uh… Coffee mam… For all three of us,” Felix says, and tosses a few silver dollars on the table. Harvey and Samuel look at one another, “Where’d you get the stash Felix? Been holden out?” speaks Samuel. Felix smiles, “Nah, it was for a rainy day… Or…. Snowy day as it were,” the other two smile, and take off their coats. Meanwhile Felix’s gaze returns to the bar… And what he sees amazes him. Outside of the bar, a man in what appears to be Red Knight Armour, dragging a long mace on the ground, enters the bar. The waitress brings the coffee. “There you go fellows, let me know if you’d like anything else,” speaks the waitress. “Soup…” the voice of a lovely young brown haired woman suddenly speaks. “Soup for all of them…” she finishes, and hands the waitress a twenty dollar bill. Felix and the others look at the girl who has lavender eyes, and smiles as she leaves, pulling on a long dark purple coat. “Soup it is,” says the waitress, and steps away. “Well this is our lucky day,” speaks Samuel as he stirs in milk and sugar into his coffee. Felix dashes back out into the snow filled streets, and crosses the street. Meanwhile inside The Devil’s Retreat, the man in red armour, sits at the counter. In front of him are three bottles of red wine, the first already empty, as he drinks directly out of a fourth bottle. Patrons of the bar sit as far from him as they can. And the bartender looks a bit taken aback, but at the same time, has seen some strange things in his time. “Rencor… Is that you?” he says to the Red Knight, whose hair is light brown, straight, and goes down to just above his shoulders. His eyes are dark blue. “Risk… You can call me Risk,” he replies.